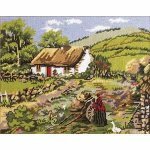 An Irish Landscape needlepoint kit from the elegant Primavera. The design measures 13" x 10" and is professionally color-printed onto 12 mesh interlock needlepoint canvas. 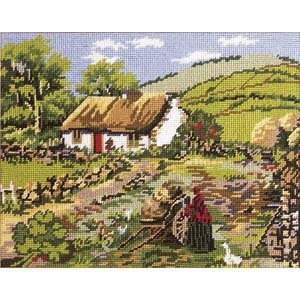 Other Primavera countryside designs are available depicting the Scottish, Welsh & English countrysides. This Primavera needlepoint kit comes with Anchor tapestry yarns which are 100% wool yarns specially formulated for needlepoint. They are easy to work with and do not require splitting - you work with a single strand. There is enough yarn to work in tent stitch and we can supply more should you need it. A high quality needle is included in this needlepoint kit. Stitching instructions and a color photograph of the finished design are also included. This Primavera needlepoint kit is suitable for beginner and experienced stitchers. Please contact us with any questions. We are always glad to help and we try to reply promptly. 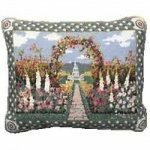 All our needlepoint kits and canvases ship from California and payment is in US dollars. We ship USPS Priority Mail (within the U.S.) or US International Mail to other destinations.